Home » ceremides » natural hair » oils » LOVE CEREMIDES HAIR OILS?...DON'T LIKE THE MESSY APPLICATION? LOVE CEREMIDES HAIR OILS?...DON'T LIKE THE MESSY APPLICATION? Do to our age of information, women everywhere are discovering how great oils are for the hair. A lot of these oils have large amounts of ceremides in them. Ceremides are naturally occurring lipids found in the hair fiber. The ceremide molecules bind the cuticle cells to the cortex, acting as a hair glue. Damaged hair has typically exhausted its natural supply of ceremides which leads to dry and unmanageable hair. Under the electronic microscope, the scales making up the cuticle appear to be a firmly held together by a cement rich in lipids. I love putting oils on my hair, but I hate having greasy, oily hands afterwards. So, over the past few years I have been using the MISTO to apply my ceremide oils on wet hair. I also use it as my hair spray ( grape seed, aloe vera, & water) to mist my hair at night before bed. You have to pump it several times before each use to build the pressure back up. This helps the sprayer keep spraying like a fine mist. Sort of like an oil sheen lol. I use less oil so it saves me money as well! Here are a list of oils and the percentages of ceremides that are in them. I highlighted the ones that I used. 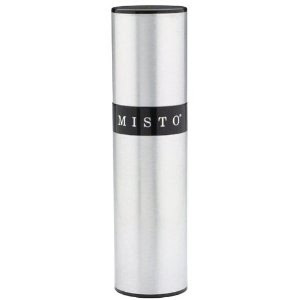 So is anyone else using the misto? If not how are you applying your hair oils?